Inflatable kayaks allow you to get outside and on the water just about everywhere thanks to their easy portability – something that hard shell kayaks simply can’t match. However, even inflatable kayaks vary drastically from one another in the water pursuits they are designed for and different models offer a variety of advantages and drawbacks. In this guide, we’ll walk you through everything you need to know in order to pick the best inflatable kayak for you so that you can enjoy a great day on the water. Number of seats – Most inflatable kayaks are either designed to be used solo, or in tandem with a partner. Solo kayaks are great for those who spend a lot of time out on the water by themselves, or when you like to explore more or less than your frequent kayaking partner and need the freedom to paddle away. Tandems can be a great way to get two people out on the water for only a little extra weight, but can be difficult to paddle by a single person because of the added weight and larger frame. Convertible kayaks, which are designed to be interchangeable between one and two seats, are another alternative but take some additional setup time and weigh more than their solo or tandem counterparts. Portability – Weight is the biggest concern in sheer portability, but other features like backpack straps, suitcase-style handles, or deflated size also come into play. When considering portability, be sure to think about how likely you are to take the kayak to a lake that requires a hike in versus simply your local boat ramp. For tandem kayaks, portability from the car to the water’s edge may not be a huge concern for many people since you can split the load with your partner. However, for solo kayakers, weight may become important in being able to load the kayak in and out of your vehicle. Intended use – Inflatable kayaks span a range of designs, just like their hard shell cousins, so it is important to think about what you will primarily be using the kayak for. Sit-on-top kayaks are a comfortable design best suited for kayak fishing and paddling on calm open water, since they don’t offer the stability of a kayak with a cockpit. Inflatable kayaks that feature a cockpit and are designed with stability in mind can handle rougher waters and some waves, although if you’re frequently heading to rough conditions a hard shell kayak may be the better choice. Storage – Different inflatable kayak designs also vary widely in the amount of storage space they offer. Sit-on-top kayaks may have areas of cordage that allow you to fasten your gear around your, while many cockpit designs enable you to attach gear bags in front of and behind the cockpit. If storage is important to you – for example, if you plan to spend entire days out on the water rather than a few hours at a time – be sure to look for ample storage options. One of the features that sets the Advanced Frame kayak apart from other inflatable kayaks is that you don’t have to choose whether you’ll be paddling solo or tandem at the time of purchase – this kayak is convertible between the two. The seat backs are separate from the kayak itself and can be installed at three different points within the cockpit, so that it’s easy to interchange between one seat and two seat setups. 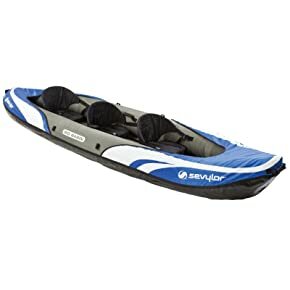 Plus, the removable seat design allowed the manufacturers to make the seat backs burlier than on other inflatable kayaks, so there is more padding for long paddling trips. That convertible design does have some setbacks, though. When using the kayak in a solo configuration, the floor tends to sag in the middle of the kayak. The hull of this kayak is designed for whitewater, and the kayak is rated for up to Class III rapids. The rigid bow tracks well in the water, aided by a rear skeg that helps when making tight turns. However, plan to get wet in rough water as the kayak rides low in the water, especially when loaded down with two people and gear. If you’re looking to get out on the water but don’t want to invest heavily in a new kayak, the K2 kayak is an excellent budget choice. At less than $100, it’s one of the most affordable kayaks on the market. To be fair, this kayak is less of a whitewater-ready boat than a kayak-shaped pool inflatable. The design is made rigid by a series of I-beams running the length of the underside of the kayak, which provide some rigidty but little stability against swirling currents. As a result, the K2 is suitable only for still lakes and extremely slow-flowing rivers. 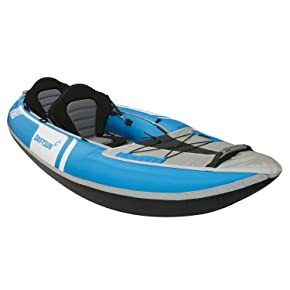 In addition, the seats are part of the inflatable design and so do not provide much support for paddling over extended periods. That said, the kayak does have some design features that make it perfect for an easy day on the water. A removable skeg helps with tracking the kayak across a lake, while the high side walls prevent water from getting into the cockpit. The tandem design is especially nice for people looking to enjoy a lunchtime paddle, as there is plenty of storage room for picnic supplies and the seats can be flipped around to face each other. This kayak from Sea Eagle does it all, and well. First, this kayak is designed to fit up to three people – two on the tandem seats, and one in the middle. And while having a third person may lead to some discomfort, this means that there is plenty of space for a dog or multi-day trip supplies. In addition, the kayak is almost as easily paddled by a solo user as by a tandem team. Second, this kayak is extremely stable. While the design is not intended for whitewater, it can hold up to medium-sized waves that appear across a lake on a windy day or to mild coastal paddling trips. The kayak is so stable that it is difficult to capsize, even when trying to rock it. Plus, if you do decide to hop out of the kayak for a quick swim, it’s easy to climb back in without flipping the boat. The kayak’s speed and maneuverability is helped by a pair of skegs. However, these can also be a curse if one gets turned slightly while inflating the kayak – a bent skeg will leave you paddling in circles. If you’re planning to frequently kayak with three people, the Big Basin kayak is the one for you. 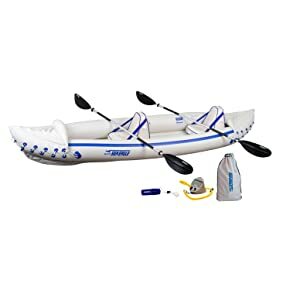 This inflatable kayak sports three removable, inflatable seats, so it’s easy to adjust for paddling with only two people as well. Plus, the seats are highly adjustable, making it simple for each person to adjust the seat back as needed to achieve support for longer paddles. However, if paddling with three people, note that the kayak is only rated to hold 490 pounds – which is easy to exceed when you add gear into the cockpit. In addition, there is little storage space on the frame of the kayak, in particular because the hull lacks bungee cords. Despite being relatively large, this kayak also moves well through the water. The rear skeg provides straight tracking, while the wide design offers stability against rolling and capsizing. While not intended for whitewater, the kayak is stable enough to be paddled in moderate wind on an otherwise calm lake. The side walls of the kayak are high to prevent water from overtopping into the cockpit, plus the kayak comes with a set of inflatable spray covers to help keep you dry from paddle splash and larger waves. NRS is a well-known company in the kayaking world thanks to their high-end gear, and the Pike Angler is no exception. While it comes at a price premium, this inflatable kayak delivers superior performance and has a number of design features that make it perfect for a day of fishing. First off, this kayak performs on the water almost as well as a hard shell kayak – which is a huge compliment for an inflatable kayak. The kayak is maneuverable without a skeg attached, but also comes with two different removable skegs to help with tracking in windy conditions. The seat is removable, adjustable, and extremely comfortable, which goes a long way in supporting your back during a long day of paddling. Plus, because of the removable design, it is also possible to purchase a second seat and convert the kayak into a tandem. For fishermen, the best features of this kayak are the ample storage space and numerous tie-down points. 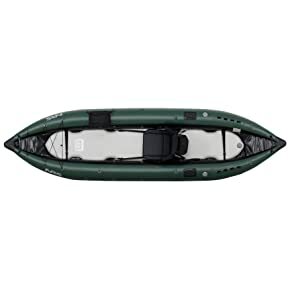 The kayak’s hull is lined with metal grommets and nylon webbing to tie fishing gear down, while the front portion of the kayak is covered with bungee cords and the back of the seat even has a large zipper pouch. It also has three fishing pole mounts on the hull – perfect for the angler with multiple rods. When using the kayak solo, the cockpit has plenty of space to store overnight camping gear. At only 22 pounds, it’s hard to come up with an excuse for not bringing the Sea Rebel kayak along anytime you’re headed to a place with water nearby. The light weight makes this among the most easily transportable inflatable kayaks on the market. Before buying, note that the maximum weight capacity is 200 pounds – so this kayak is not suitable for heavyset people. That lightweight design is achieved by transforming this kayak into a sit-on-top kayak rather than a traditional cockpit kayak. This makes the kayak stable in calm water, such as on a lake or slow-flowing river, but certainly not suitable for any kind of rough conditions. On the plus side, this sit-on-top configuration makes it easy to stand up and walk the kayak over shallow water, and to get on and off if you decide to hop off for a swim. Furthermore, there is little room for gear storage on the kayak’s hull. One of the serious problems with this kayak is the backrest of the seat. It has little rigidity and flops backwards when you try to lean against it, leaving you to support your body upright when paddling using mostly your abdominal muscles. This can quickly get tiring and, for many people, makes this kayak unusable for anything more than a short paddle. If you want to go from purchase to getting on the water in the shortest amount of time, the Voyager 2-person kayak is an excellent choice. While not cheap, this kayak comes with everything you need to hit the water – a pair of paddles, a pump, a removable skeg, a repair kit, and even a carry bag. 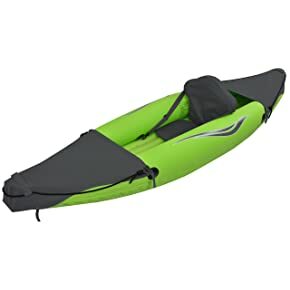 Plus, the kayak inflates in under 5 minutes of pumping and at only 27 pounds it is easy to carry this kayak from the car to the water’s edge. Once in the water, this kayak continues to perform well. The wide design and high sidewalls make this kayak extremely stable in moderate winds and help to keep water from splashing into the cockpit. With the skeg attached, the kayak tracks through the water well. The seats, which are detachable, are made of EVA foam rather than designed to be inflatable as for many other inflatable kayaks. This foam design is still lightweight, but provides significantly more back support and comfort during long paddles. 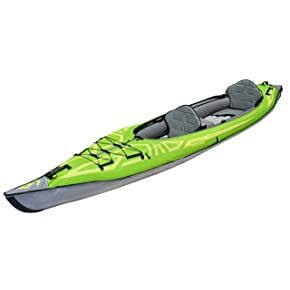 Unfortunately, the kayak does not come with foot supports to push against when paddling, but these can be added after market. The Tuff Stinger 3 is a performance kayak that can handle a little bit of everything, perfect for the solo paddler in search of adventure. 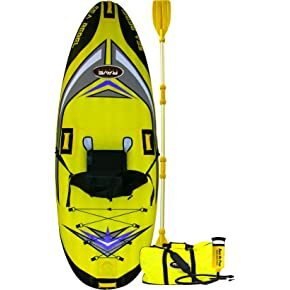 The rigid design is comparable to a hard shell kayak and is perfect for taking out in rough conditions, such as on whitewater or in rough coastal surf. The 3-layer PVC air chambers are puncture resistant and redundant, so that even if you do end up with a tear it won’t leave you stranded in the middle of your paddle. Plus, the skeg (the kayak comes with two) makes tracking easier and can be removed in shallow or particularly rough water. Another great aspect of this kayak, given that it is designed to be used solo, is its light weight. At only 25 pounds, a single paddler should have little trouble getting this kayak from the car to the water. The only downside is that the instruction manual is extremely unclear on how to inflate the kayak properly – but this is easily overcome after learning how to do it over the course of a few outings. The seat is inflatable, which unfortunately does not provide the same support as a molded plastic seat. This can be a problem for all-day use, although for trips lasting a half day or less the seat is comfortable enough. This kayak also comes with a paddle, a welcome addition especially considering the modest price tag. Is an inflatable kayak right for you? Inflatable kayaks offer a massive increase in portability over hard shell kayaks thanks to the fact that they are significantly lighter and pack down to a much smaller size. For anyone paddling primarily in calm waters, this can be the difference between using your kayak every weekend or only once in a season, and makes storing it at home easier, too. However, inflatable kayaks are much less stable in the water than hard shell kayaks and are prone to flipping – therefore, they are not suitable for frequent use in rough waters. 2. Will they leak and sink? 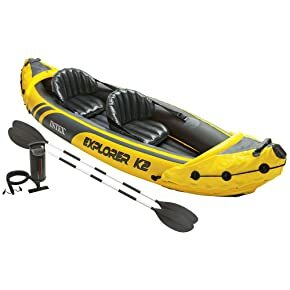 Inflatable kayaks are much more durable than many people initially think – unlike a light rubber pool toy, these kayaks are designed to take a beating and most models won’t easily puncture from running into rocks or other obstacles. If you do get a leak, you are still generally safe from sinking. Most inflatable kayaks have thee separate air compartments, and having two intact is enough to keep you afloat. Plus, most common punctures are small and easily fixed on the spot with a repair kit (which you should always carry). The majority of inflatable kayaks are currently made of PVC (polyvinyl chloride) – the same stuff that is used to make pipes – because it is extremely tough and waterproof. However, PVC does wear down over time and needs to be treated with a spray to keep your kayak in good condition. A common alternative to PVC is Nitrylon, which is somewhat more resistant to punctures but also heavier. Many high-end inflatable kayaks are now using Hypalon, which is an extremely durable synthetic rubber material. It is lighter and stronger than PVC, but also considerably more expensive.